LINDSAY – The second leg of the Champions Cup this Friday night could play a huge part in deciding who takes home the 2019 East Sequoia League title. The Lindsay Cardinals remain in second place after falling in double overtime to the first place Farmersville Aztecs earlier this month. The Cardinals (12-6-3, 6-2) led the Aztecs (19-6, 6-1) 3-2 in stoppage time of the second half of their first matchup at Farmersville. It seemed as if Lindsay was going to continue their winning streak until a defensive mistake allowed the Aztecs the tying goal. Their tying goal opened the door for a come-from-behind double overtime win, 4-3. In the matches since their loss to Farmersville, Godoy has been at work fine tuning their game plan. It has even involved moving some key position players into new spots on the field. A split result in this rivalry has only happened twice. That was in 2011 and 2014. On both occasions the Cardinals won the second meeting at home. A feat they look to accomplish once again when kickoff happens at 6 p.m.
Lindsay’s biggest advantage in the rematch might not be a player or formation, but the fact Lindsay’s speed is amplified by the all-weather turf home field. The Cardinals are 44-8-2 in home league games since the turf was installed in 2007, and it played a key factor in both years they won the second matchups against the Aztecs. 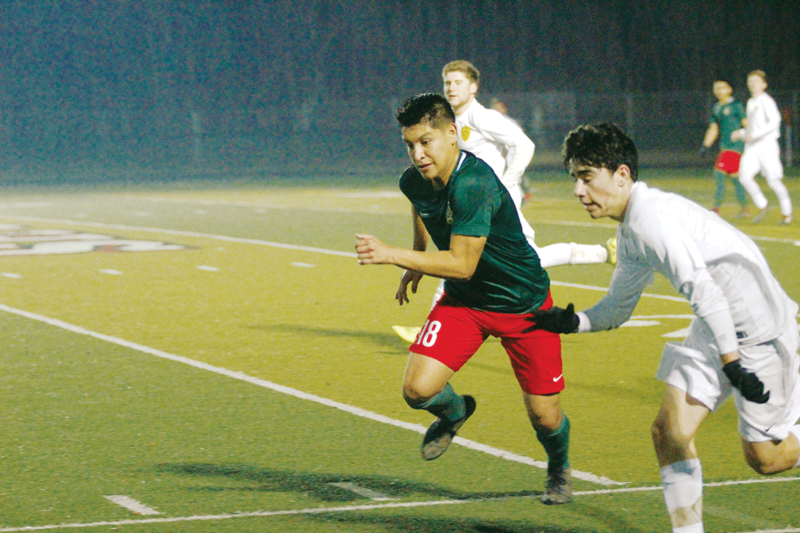 The latest example of their improved speed was their 9-0 rout of the Sierra Pacific Golden Bears (2-13-1, 0-8) last Thursday night. “We kept the game moving forward and that is what I like to see,” Godoy said. Lindsay was able to attack both up the sides of the field and send crossing passes into the box and go straight through the Sierra Pacific defense. Although, both worked the Cardinals tended to favor the edge, and it was off one of those attacks which presented their first scoring chance. In the sixth minute a crossing pass bounced off the hand of a Sierra Pacific defender in the penalty box giving Lindsay a penalty kick. Ulises Lopez took the shot and became the first of eight Cardinals to score. Lopez struck again three minutes later. This time it was up the middle and he was able to squeeze through the back line. When the Sierra Pacific goal keeper came out to knock the ball away, Lopez kicked the ball up and over and scored. However, before the rematch Lindsay can’t suffer a setback if they an opportunity to win their ninth straight league title. Tonight, Lindsay plays the Granite Hills Grizzlies at 6 p.m. In the first meeting Lindsay defeated Granite Hills 3-0.